Most curlies and coilies have a love/hate relationship with silicones. They can weigh down your hair and even create buildup. I tend to steer clear of them, but there are times when they are necessary and come in handy. Hair serums are silicone-based products that will sit on top of the hair as opposed to oils that penetrate the hair shaft. Some of the serums in this list are silicone free and alcohol free so don't dismiss the list quite yet. The variety of serums has increased so don’t think they all do the same thing. Some are for making your hair shiny while others are for protecting your hair when you apply heat. They even have some that protect your hair from the sun’s UV rays and from humidity. They protect in various ways and they will make you rethink your reasons for steering clear of silicones. Check out these serums for protecting your hair during the summer. Champagne wishes and caviar dreams can be for your tresses with this rich elixir. Formulated with champagne grape and caviar extracts, you get a solution powered for growth-enhancement and strengthening of your hair. Dry, dull, lackluster hair deserves this ultra-posh treatment. Here is a high-gloss elixir fortified with hydrolyzed natural silk fibers that coat and smooth out your worn out strands. Your hair will get a rich conditioning treatment that transforms your hair into a manageable mane. Dry scalp is so last year! This scalp nourishing elixir is highly concentrated by being in a hybrid safflower oil so a little goes a long way. The ylang ylang and cedar extracts are great for the maintenance of dry scalp sufferers with any fungus and bacteria. A great serum to scalp and hair health. Heat protectant is a necessity for curlies to decrease the likelihood of experiencing heat damage when using heat tools. This heat protectant serum is a strengthening and protecting serum that will control frizz, improve your hair’s health, and protect it from the heat. This product is formulated with macadamia oil to keep your tresses damage free from high temps of the blow-dryers, flatirons, and curling irons. Curlies want to be straight sometimes too, and with this straightening serum it can be possible. It’s made to keep your tresses straight and smooth with a wicked humidity resistant formula that even cuts your drying time in half. All you are left with is sleeker hair. Here is a featherlight serum that’s alcohol free and won’t give a greasy buildup. Mizani’s high gloss serum gives a powerful shine that’s lasting and lustrous. With Spradiance a little can go a long way. If your curls are in distress, then they need the Wild Harvest Hair Curls Serum to bring them back to life. A sulfate, paraben, phthalate, and sodium-free serum/cream that’s chock-full of natural ingredients from all over the world. 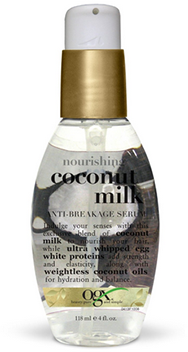 Retain more moisture, fight frizz, and reactivate your curls with this wonder in a bottle. Try this weightless serum with coconut oils, silk, and keratin proteins. They create a masterful silk repair therapy that will refresh, moisturize, and nourish your thirsty strands. Treat your damaged, chemically treated hair with the serum it needs. A Best of the Best in 2013 by NaturallyCurly for leaving your hair softer, sleeker, and shinier than you’ve ever experienced. Prevent frizz by using daily and capitalize off this moisturizing condition serum that made with an exotic blend of components. BioSilk Silk Therapy is the hair therapy that reconstructs, reinforces, and revitalizes your tresses. It’s great on wet or dry hair and has hydrolyzed silk proteins for strength and shine. It is made with 17 amino acids that penetrate and aid in protecting and improving your hair. You want the shine and definition that won’t strip the moisture of your strands like some alcohols will. 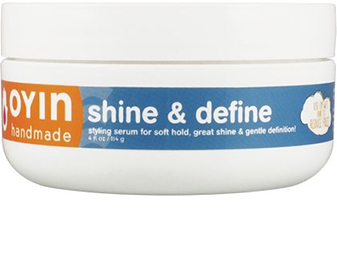 This shine and define styling serum is formulated with vegetables sources so your strands are moisturized and soft. A nourishing, soft, creamy serum filled with herbal infusions, aloe vera, flax seed extract, and all the goodness to give your hair what it thirsts for. Here is a growth serum that stimulates the scalp and increases circulation from the powerful essential oil blend. Only a few drops are needed so don’t overdo it. Just massage into your scalp twice a week at night for best results. Rusk is great for shine, smoothness, and protection without sticky or weighty build-up. This serum is alcohol free and will fight the frizzies and split ends with a vengeance. The moisturizing ingredients will work wonders on your overstressed tresses. Aveda brought the good stuff with this fluid styling formula that will bring movement and shine to your distressed strands. This is formulated with plant-based ingredients that will condition and smooth your hair while staying weightless. You’ll be left with soft touchable hair. Here is a glossy serum made for adding shine to your hair. This is great for moisture retention that otherwise gets lost during washing. It's perfect for dry, dull tresses but remember a little goes a long way.